The pillow mint is a close second. But at this point the hotel bar is well established as the best part of the hotel. Which is why we’d like to point you in the direction of the Hotel Chantelle today, a charming new hotel bar that comes without the burden of the actual hotel, now open on the LES. You’ll find Chantelle—based on a bar in Paris—on a (relatively) quiet corner of Ludlow, in a (deceptively) drab and squat building. 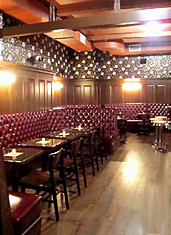 On the other side of those unmarked doors is a vintage wonderland of plush pin-tucked leather banquettes under colored globe lights, meant to whisk you and your date away from the LES and deposit you somewhere in Paris circa 1940. Ordering a couple of blackberry brambles and making the rounds among a friendly neighborhood crowd, you may notice some closed doors toward the rear. But if you prefer to know what the future holds: in a few weeks, a classic French restaurant will be opening on the roof under an all-weather retractable ceiling. Then there’s the basement dance club, a subterranean gem of drinking and debauchery, accessible only to those who receive an actual skeleton key from the owner. This last level is not slated to open for another few months, giving you sufficient time to secure your key. Now, back to the blackberry bramble.